Managing your dog on a leash (or lead) is the best way to protect him from harm. You can control him from running into a busy street – prevent others from feeling frightened or annoyed by unwanted attention from him. Keeping your dog on a lead in public spaces is also a legal requirement. It's vitally important to teach your puppy or dog to wear a collar and walk with a leash attached to it. While all training experts agree on this basic point, there are as wide a range of collar and lead styles available as there are methods for teaching your pet to use them. No matter what style collar you choose, it must fit properly. Make sure that it's not so tight that it might restrict your pet's swallowing or breathing, and not so loose that it might slip over his head. In a proper fit, you should only be able to insert two fingers snugly under the collar. Check the fit frequently on a growing puppy and periodically check the collar of adult dogs, as gradual weight gain or loss may go unnoticed. Make sure that the collar and lead suit both the size and strength of your dog. 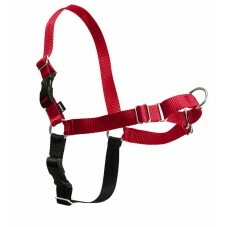 There are nylon, leather, or chain collars and leads, as well as muzzles and harnesses. A standard lead length is six feet, though some are longer and some are retractable. 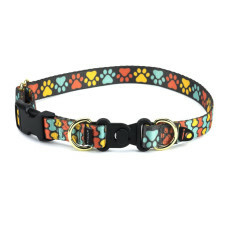 While nylon and leather collars tend to be most popular, a wide assortment of styles and colors can be found through any pet store. 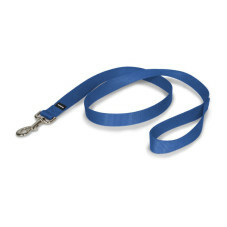 ID TAGS: Make sure to securely attach an identification tag to your pet's new collar. It should give your name, address and phone number. Lead training requires patience and persistence. You're establishing a bond of trust and a new way of communicating with your pet – things that don't happen overnight. While there are many specialized training techniques for lead training, the basic points are diligent practice and consistent reinforcement of desired behaviors. Dogs are eager to please and enjoy attention from their owners. With a bit of disciplined effort, you'll quickly have your pet wagging his tail at the sight of his leash. Begin by putting his collar on at feeding time, or playing with your pet as soon as the collar goes on – distract him until he stops noticing it. Once the pet is used to the collar, attach his leash. Allow it to hang loose and again employ food/play distractions. After a couple/few days of allowing your pet to become used to wearing his collar and feeling the leash dangling, pick the leash up. Hold it LOOSELY and encourage him to follow you around. Make it a game: the goal is to keep your pet from becoming fearful and freezing up. Offer treats or praise as incentives and rewards to keep him relaxed and moving (once he's learned that wearing a leash means a fun walk outdoors, he won't need treats anymore). Don't allow him to pull ahead or drag behind. Keep the leash LOOSE. When your pet pulls it tight, stop, or guide him to change direction. You are teaching him that puling will slow, rather than increase, his progress. With consistent practice you will establish clear signals between you and your pet, and he will understand that a tight leash is not a normal condition, it is a signal to stop or turn. When you feel your pet is ready to try walking outdoors on his leash, choose a time and place with as few distractions as possible. Use the same techniques as in the home. Your reward for this patient effort will be a well-behaved canine companion who is welcomed everywhere.